I’ve been trying to walk every day and today’s weather made it “oh so easy”. It was a gorgeous, cool September day. I am fortunate enough to live near Glenwood Gardens and I often head there for a nice walk. As I was pulling up I decided to check my Geocache app to see if there were any Geocaches located in Glenwood Gardens. Lo and behold – there are NUMEROUS caches at Glenwood Gardens. Who knew?! I use the Cachly app (around $5) and love it. I fired it up on my iPhone and it brought up a number of possibilities around me. I read the brief descriptions on each geocache and decided on a cache that was a multi-part cache. That was a new concept for me. The description told me to find three clues before I went to the final location. For this cache I had to follow the instructions (located in the cache description) to find some numbers located on three different park signs. Then the numbers were put together to reveal a combination for the lock that was at the final destination. 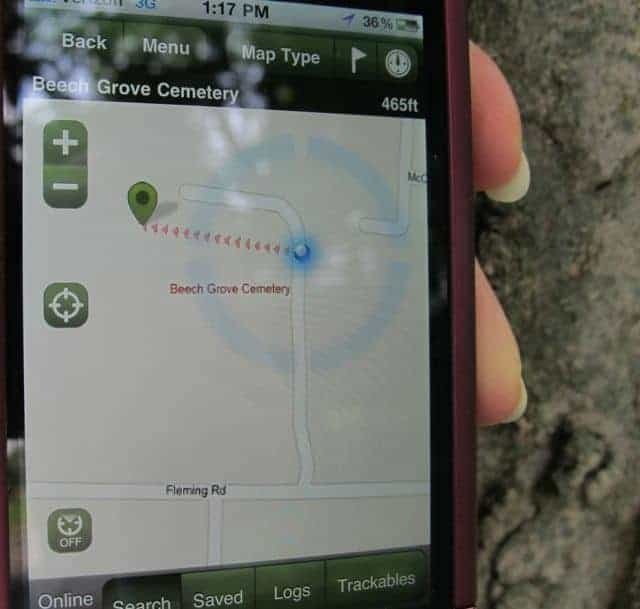 The final destination was found using the phone’s GPS (just like you’d find a regular geocache). There’s a wide array of trinkets and goodies in the box. Bring something to leave and you can take something from the box. There are all kinds of great kid toys in there. And be sure to bring a pen so you can sign the log (this one is a small spiral notebook). The pencil in the box didn’t work so I couldn’t sign it … so someone bring a pen with you to leave in the box. I’ve been wanting to do this – I think my husband would love it. You sold me! Is there a free app that you can do it with to try it out? There are free apps but they don’t appear to be all that well received. That’s why I went with the $10 version. It does everything I want at this point. I figure it will give me hours of enjoyment for just $10. I’ve been geocaching for over 2 years and I’ve done the geocache mentioned in the article. It’s a great hobby that gets you out and about and it can be done nearly anywhere. I guarantee you that wherever you go in this world there will be a geocache nearby. It can really be as easy or as complicated as you want and my kids find it exciting too. I currently use an offline app called Geosphere on my jailbroken iPod touch with a GPS puck but I started out with a cheap hand-held Garmin.